Need a fix of some great new Chicago music? Head to the Hideout this Thursday, September 16, where locally-based three-piece Darling will celebrate the release of their first full-length record, Lights That Last Forever. 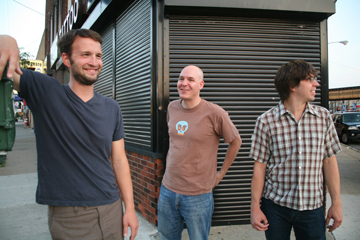 Darling cite the likes of Built to Spill and Pavement as influences on their MySpace site, but I personally also hear some classic college rock in their well-crafted, thoughtful indie pop/rock. Early R.E.M. came to mind while listening to many of the songs, and that's definitely a great thing. Both lyrically and musically, the material has an emotive, melancholic vibe, but it's also quite poppy and hopeful throughout. Check out an mp3 of one track, "Bicycle Ride," below, and hear for yourself. Tin Tin Can and Rachele Eve will also play the show starting at 9 p.m. Click here for tickets and more information. If you can't make it to Hideout, Lights That Last Forever will be out on Cardboard Sangria Records on September 28 in both CD and cream-colored vinyl formats. Or, if you want to give it a listen now, it's already available digitally.